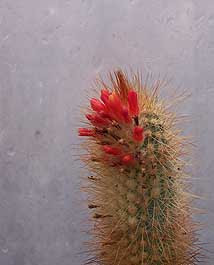 "The surfaces of many cacti are comprised of minute scaly leaves covered with clusters of sharp spines." Really? 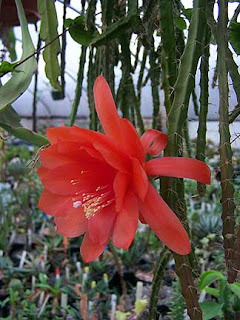 Most cacti don't have leaves, scaly or otherwise, except at the seedling stage. And besides, in my opinion, a terrarium isn't really the best environment for growing desert cacti. A new study has revealed that eating the prickly plant before boozing prevents post-alcohol sickness and headaches. Researchers at the Tulane University, New Orleans say that the cactus’ atypical carbohydrates obstruct the gut absorbing too many sugars. “Many of the health benefits of cactus are related to its water-retaining properties,” The Sun quoted lead researcher Prof Tony Blake, as saying. “It is a good source of vitamins A, B, C and K and contains many essential minerals,” he added. The original source was from the news portal for Indians in Thailand. Oh, be sure to note: You have to eat it before you overindulge! While I was out photographing some plants in the greenhouse, I pointed the camera up and took this shot. Tells you why we gave some thought to naming the nursery Rainy Day Cactus. But wisdom prevailed. Besides, there's a nursery by that name in Eugene, Oregon (or at least there used to be), so it wasn't exactly original. Oh well, just another Western Oregon day of rain and muck! There was a reference to this on Cactus Jungle a while back. For those who cross stitch, hey, why not? Awesome raffle prizes for your local succulent society! patterns are available at S-Embroidery.com. Even in the Winter, there's something of interest in the greenhouses. Will be posting some new photos on the nursery website (link on the right) in the photo gallery slide show, including these two. Enjoy. Sometimes the unexpected surprises are the best ones. The plant was kind of out of sight (and thus out of mind), but then, while checking out the "out of sight" plants, wow! The plant is Hoodia flava (syn. Trichocaulon flavum) and what a pleasant surprise. Aloes get the attention this month in Horticulture Magazine. 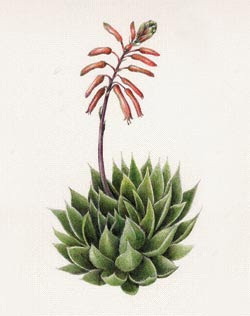 The author (Daniel J. Hinkley) mentions several aloes which are hardy in the Northwest, especially if given good drainage, and he mentions Aloe vera as his entry point for discovering the many other species of interest. The genus Aloe merits wider use, be it in a potted collection or in mixed plantings. More than any other plant, aloe vera is an icon of the 1960s and '70s (at least within the realm of legality). Our nursery doesn't grow Aloe vera for sale, since it's readily available at the local supermarket, but it's an interesting case in point. The name is itself confusing. If you look it up in various reference sources, it has a long list of synonyms. The most common synonymy is with "barbadensis". Which is the correct species name? I've read authorities who come up with differing conclusions, but the trend now seems to be to accept Aloe vera and relegate Aloe barbadensis to synonymy. And then there's the plant. Some of the plants sold have spots on the leaves, others don't. Some are quite large, others very small. What's what? Let's begin with the fact that the juvenile form and the adult form are quite different (juveniles=spots, adults=usually not). And then there's the matter of culture, how they're grown. And finally, there are probably quite a few hybrids circulating out there. Whatever, this is among the most widely distributed of succulent plants and a good starting point for anyone, due to their ease of growing. More later. The storm did most of its damage on the Oregon Coast with 127 mph gusts and huge power outages. Here, just a few branches down - including a couple from the coast redwood out by the greenhouses. So, it's time for a break and a peek in the greenhouse. O, those Lithops. Love 'em. Leave it to the newspapers and the TV news to get everyone a little jittery over our next expected storm. Headline: "Oregon may get first hurricane warning" Then, buried deep inside the article, it's explained that the term "hurricane warning" wasn't permitted to be used for non-hurricane wind storms until some 5 years ago. Compared to some of the really big wind storms we've had in the past, this one probably will be significant but not humongous. Even so, we spent some of our time today battening down the hatches in preparation for another "Pineapple Express." There likely will be wind gusts to 50 mph later today and tomorrow. Probably won't ship any plants until later this week! The original owners of this home planted a series of variegated box elders along the edge. Pretty, but very brittle, so we'll probably have some firewood pretty soon.